This year's challenge by Amy Crow is another weekly blog based on Themes. Last week's theme was OCTOBER birthdays/anniversaries, and this week is "Colourful". Not sure what to do about that theme. I don't seem to have truly colourful characters in my ancestors on either side. Sigh. So instead, I'll do another ancestor, this time in my children's father's lines. I know extremely little about this particular person, and perhaps this blog post will help me clarify where to look next. Arthur Gifford CAMPION. Now there's an interesting name. I'm sure you all are thinking he'd be easy to search, right? Nope. No records in any parish records in England, found to date. 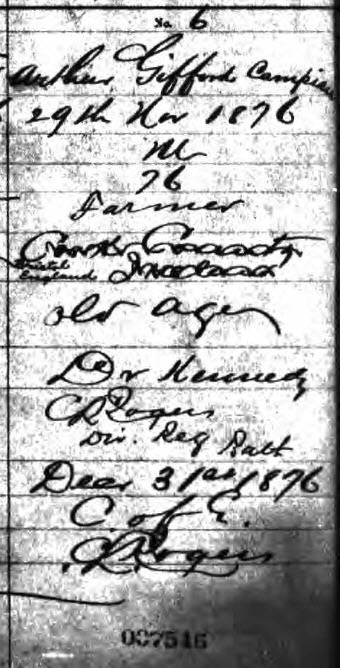 In fact his birth place is listed as Bristol England only on his death record, filled out/informed by the Doctor - or at least I assume it was filled out by the Doctor - but there is another hand writing in the words, and crossing out "Cork County, Ireland". Which is correct? Who knew to correct this? And on the same Death registration form (which holds six death registrations) is one for his youngest son, Edward. A fisherman, Edward drowned three months or so before his father. Arthur Gifford CAMPION seems to have been born around 1805, in either Ireland or in England. Censuses [of Upper Canada, Canada West, Ontario] show him born in England, and religion as Church of England, while his wife is listed as born in Ireland (R.Catholic), as are the eldest few children. Because of the consistency of the birthplaces of the children, as listed on Censuses, it seems clear that the family moved to Canada in approximately 1843-1844. They then had five more children, born in what is now Ontario, in the area of Bath or Ernestown, in Lennox & Addington county. 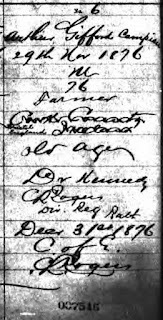 Arthur is listed as either a Farmer or a Labourer on the Canadian censuses. The boys were listed as Farmer (working in farm) when they were old enough to work instead of go to school. As they grew older, several boys list their occupation as fisherman, one as a blacksmith. Arthur's parents are unknown. He married Ellen (sometimes written as Eliza) _____, about 1832, apparently in Ireland. He filled out Ellen's death registration, and lists her birthplace as County Cork. Her headstone also states so, likely by his wishes. One of his children's death registration also states the birthplace as County Cork. So we might conjecture Arthur and Ellen lived in County Cork for a few years after their marriage. The Diocese at Cloyne is in County Cork. This information raises more questions. 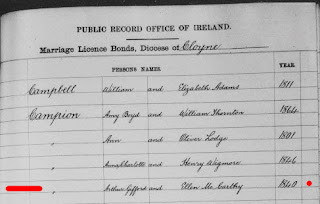 Why were they taking out a marriage licence bond in 1840, if they were already married? and had five children by this time: William, Elizabeth, Charles, Arthur, and Richard. Or should I assume that Arthur was married previously and the first 4 or 5 children are from this first wife; the remainder of the children with his 2nd wife, Ellen McCarthy? More research needs to be done to clarify this important question. of Consumption (TB); 4 children, all who died of TB as well. 4. Arthur jr., b. 1839, Ireland, d. 3 Feb 1917, Bath ON; m.? 10. Edward, b. 1853, Upper Canada, d. 3 Aug 1876, Bath ON; drowned. Arthur and Ellen and their children are found on the Canadian Censuses, and also are found in the 1871 Lovell's Canadian Dominion Directory, in Bath Ontario. I would like to find Arthur's birth date and birth place, possibly in England. 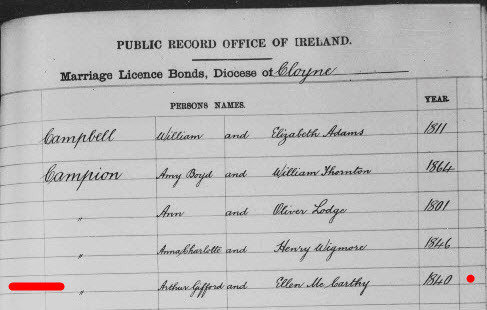 And then, it would be wonderful if I could find a marriage record for Arthur & Ellen in Ireland, likely in County Cook, but also possibly in Dublin. As Ellen is always listed as following the church: "R.Catholic", she likely would be found married in the church... Or, because Arthur and the children are always listed as following the Church of England (Anglican Church in Canada), possibly they had a ceremony in a C of E church? I need to research the possibility. With Ellen's maiden name, we might learn more about her and her family as well. And of course, I'd love to learn more about Arthur and his family of origin. There are many questions about Arthur and his wife. In the Bath area around Ernestown up to Collins Bay along the waterfront, there are other Campion families, but I'm not certain that they are related, and have no idea how to prove them related. Ellen appears to be several years younger, on all of the Censuses. Arthur is the informer on her own death registration, (reg. Dec 15, 1875), death on 21 Apr 1875, with his signature shown as well. Ellen died of an acute heart disease, aged 64. Again, Arthur notes she was born in County Cork, but no maiden name is listed. I have a To-Do list of more places to search in Ireland as well as England, for more details of Arthur, and of Ellen. I have tried to search the marriage records of their children with no particular luck. And it is challenging to find some of the adult children in Ontario, as their names are quite common, even with Campion as a surname. Sometimes it is mis-spelled as Champion, or Campeon. If you know anything about Arthur CAMPION and his family, including Ellen McCARTHY, I would be so pleased for more details. Contact me at my address at the bottom of the page, or in the Comments section. Lately, my Blogger account seems not to allow me to "reply" to your comments, most of the time. Do know that I value your comments immensely. You make my day! Thanks for stopping by to read my weekly post. Chris - Wish I could get in touch with you to thank you! This is indeed helpful. Every little step helps, as I try to find this couple's parents, and the christenings of their earlier children. They have a confusing history, this couple. Thank you very much.